According to Manu- "Vedas are primary source of religion" the Puranas, however, are the essence of the religion of Hindu society. Puranas are also regarded as the chief source for the detailed explanation of the Vedas. They, therefore, occupy a significant place in the ancient literature of India. The Puranas have obtained the name of Pancalaksana because their contents generally embrace five topics namely (1) Primary creation or cosmogony, (2) secondary creation, (3) genealogy of gods and patriarchs, (4) reigns of the Manus, (5) history of the solar and lunar dynasties. Vamana Purana is placed at serial number fourteen in the list of the eighteen Puranas mentioned in various scriptures. But it does not mean that it is of lesser importance than the other Puranas. Although, it is smaller in size, yet it has all the constituents of the other Puranas. Also its style of treatment of the subject matter is clearer and more analytical than the style of other Puranas and Up-puranas. One of its special features is the amazing variations in the famous ancient stories as related in other Puranas. Many of the stories in the Vamana Purana have been written for the benefit of the common man with a view to make them understand the basic elements of cosmology and religion. Vamana Purana is comparatively small and it contains selfish and useless matter to a lesser extent. This Purana embeds within itself prescriptions of Hindu religion so as to make the lives of people purposeful. 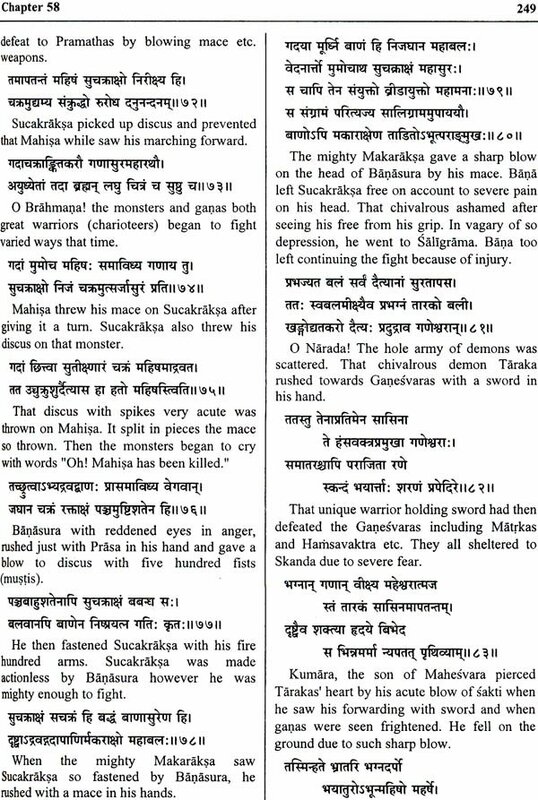 The present edition is a unique edition containing original Sanskrit text along with corresponding English translation verse-by-verse. It also includes an exhaustive introduction as well as a detailed index of verses. The editors have also rendered various foot-notes at appropriate places for clear specification of the Sanskrit proper names used thereof. According to Manu- "Vedas are primary source of religion" verse 2.6), the Puranas, however, are the essence of the religion of Hindu society. Puranas are also regarded as the chief source for the detailed explanation of the Vedas. They, therefore, occupy a significant place in the ancient literature of India. The Puranas have obtained the name of Pancalaksana because their contents generally embrace five topics namely (1) Primary creation or cosmogony, (2) secondary creation, (3) genealogy of gods and patriarchs, (4) reigns of the Manus, (5) history of the solar and lunar dynasties. Vamana Purana is placed at serial number fourteen in the list of eighteen Puranas mentioned in various scriptures. But it does not mean that it is of lesser importance than the other Puranas. Although, it is smaller in size, yet it has all the constituents of the other Puranas. Also its style of treatment of the subject matter is clearer and more analytical than the style of other Puranas and Up-puranas. One of its special features is the amazing variations in the famous ancient stories as related in other Puranas. Its second special features is that inspite of being known as a Saiva Purana, nowhere the importance of Visnu has in anyway been belittled as is the case with some other Puranas. In Vamana Purana, both Siva and Visnu have been placed an almost equal footing. Again, there is not a single sloka which humiliates Visnu. Some Saiva authors have gone even to the extent of stating" A visit to a shine of Visnu is an insult to Siva." In Vamana Purana, on several occasions Siva has gone to Visnu for help and has praised him whole-heartedly. Of all related in Vamana Purana which vary significantly from the stories as related in other Puranas, the story of immolation of San attracts special attention. In Siva Purana, Ramayana and other Purana scriptures, we are told that San had gone to the yajna performed by her father Daksa inspite of not being invited to the ceremony and when she did not find the requisite share of offering for Siva, she cursed all those who had attended such a detestable function and immolated herself then and there. When Siva came to know of this, he sent his attendant Virbhadra to avenge her death. Virbhadra reached the venue of the yajna and demolished the whole structure and put an end to the yajna. "The daughter of Gautama, Jaya had come to Mandracal to pay a visit to Sati, Seeing her all alone, Sati asked her- Why her sister Vijaya Jayanti and Aparajita had not come along?" Jaya replied, "They have gone with father to the yajna being performed by their maternal grand-father Daksa, I am also going there. But I considered it worthwhile to visit you first. Are you not going there? Is Lord Siva not going there? All Rsis along with their consorts have gone there. All gods have also gone there. Has our maternal grandfather not invited you?" The demon Dvarkasura had vanquished all the Devatas. Later, the gods came to know that none else but the son of Siva born of Parvatt alone can kill Dvarkasura, They were greatly worried as Siva was a celebate. So Indra persuaded Kamadeva to go and fill the mind of Siva with amorous feelings and to prompt him to marry Parvatt. When Kamadeva played his tricks on Siva, he was awfully furious and by activating his third eye, Siva reduced Kamadeva to ashes. However, this incident has been related in Vamana Purana as under: When Siva was destroying the yajnasala' of King Daksa, Karnadeva shot his strong, passionate and lustful arrows at Siva, he was greatly distressed and in a love-lorn state of mind he wailed for the company of Sati, When he could no longer tolerate his mental torture, he handed over all the three kinds of arrows to Pancalika, the son of Kuber. When Cupid was about to attach Siva again, Siva was greatly upset and ran here and there in the pine forest. There in the forest the wives of Rsis residing there became desirous and lustfully ran after Siva. In that serious situation, the Rsis cursed Siva, "May you loose your linga.' When the linga of Siva fell apart, it stretched from heaven to the Netherlands. Thereupon, both Brahms and Visnu came to that place. They tried to find out the terminal ends of Siva's organ but could not succeed. Thereupon, both of them prayed to Lord Siva for mercy. Siva was pleased by their entreaties and said, "If all the gods honour and worship this linga of mine, I can accept this Linga again. Consequently Lord Visnu prescribed the worship of Sivalinga for the four Varnas, For this, several new scriptures were within advocating such practice and describing the great powers inherent in the Sivalinga. The first scriptures was named Saivi, second Pasupata, third Kaladaman and the fourth Kapalika. Siva himself is a great energy centre. He was the son of Vasistha, His disciple Bhardvaja was a great Pasupat, He considered "Gopayan Tapa" as of great merit. His disciple Someswar was a king. Apastambha was equally great. Kameswar was his disciple. Dhanada was also a great devotee whose disciple Aryodara was very powerful. He was a Sudra by caste, but was a great ascetic. Thus, Lord Visnu made all the four Varnas and persons of all Asramas great devotees of Siva. After that when Lord Siva had been roaming about in Citravana, Kamadeva again prepared himself for another attack on Lord Siva. This time Siva sternly and closely looked at him from top to toe. Consequently, he was immediately burnt to ashes. It is stated in other scriptures that after this, Kamadeva was declared as 'Ananga' or Formless and exercised his sway on all living beings. However, it is stated that after being burnt, Kamadeva got transformed into five plants namely (1) Drukam Prsta (2) Campaka (3) Bakula (4) Patala (5) Jatipuspa. The arrows shot by Kamadeva at Siva were transformed into trees of a thousand variety. In reality, passion is a mental inclination which disturbs the mental poise of man from time to time. Statements like "Being hit by its arrows" can be taken only as a metaphor. The poetic allegory of spring season as an accomplice of Kamadeva as present in Vamana Purana and ultimately the transformation of Kamadeva into famous fragrant flowers of this country have become a beautiful literary composition. Concept of Kamadeva or Cupid is a natural extension of the process of creation and emergence of man and this has been presented in Indian Puranas and foreign mythologies in different ways. Description of the Seven Islands (Sapta Dvipa) is considered as an essential component of Pauranic literature. In ancient times, because of the difficulties of transportation, travel through the length and breadth of the whole of India was considered as a great accomplishment. However, the description of the then existing Saptadvipa as available in the scriptures of those days is not true to facts today. It is only in some respects that the description of Jambudvipa agrees with the present position of Asia. Under such conditions, the description of various regions of India and the mountains and rivers therein as given in Vamana Purana is very significant. Although many of the names have since changed and some may even be fictious, yet the information is greatly useful for the archaeologists. Presenting a description about the mountains of India, it is stated in Vamana Purana, "Mahendra, Malaya, Satya, Suktimana, Rksa, Vindhya and Pariyatra - these seven are called Kulaparvatas.' In addition to these, there are other thousands of mountain ranges including Kolahala, Vaibhraja, Mandara, Durdharacala, Vatadhuma, Vaidyuta, Mainaka, Saras, Tunga, Prastha, Nagagiri and Govardhana. Also there are hundreds of other mountains like Ujjvamanta, Puspagiri, Arbud, Raivata, Rsyamnka, Sagomanta, Citraknta, Krtasmar, Sri mountain, Kaukanaka etc. While giving a description of rivers, it is stated that Sarasvati, Pasyarupa, Kalindi, Hiranvati, Satadru, Candrika, Nila, Vitasta, Iravati, Kuhu, Madhura, Hararavt, Usira, Dhataki, Raksa, Gomatl, Dhutapapa, Bahuya, Drsadvatl, Nihsvara, Gandakl, Citra, Kausikl, Vadhusara, Sarayu, Salauhitya etc. are the rivers which come down from the Himalaya mountains. Apart from these, there are other rivers originating from the mountains as Parnasa, Nandini, Pavant, Mahl, Sara, Carmanvati, Lupa, Vidisa, Venumati, Citra, Odhavati, Ramya etc .. Pariyasa, Sona river, Mahanadi, Narmada, Sursa, Kriya, Mandakini, Dasa, Citrakuta, Daivika, Citrotpala, Tamasa, Kartoya, Pisacika, Pippalasrethi, Vipasa, Vanjulati, Satsantaja, Suktiati, Cakrini , Tridiya, Vasu and other streams come down from the Rksa mountains. Valguvahini, Siva, Payosni, Nirvindhya, Tapl, Sanisadhavati, Vena, Chaitrani, Sinibahu, Kumudvati, Topa, Reva, Mahagauri, Durgandha etc. flow down from Vindhyacala, Godavari, Bhimrathi, Krsna, Vaisya, Saridvati, Visamadri, Supryopa, Kaveri, Dugdhoda, Nalini etc. are big rivers which originate from Salya mountain. Kritmala, Tabhraparnt, Vanjula, Utpalavant, Suni, Sudama etc. come from Suktimana mountain. All these rivers are very sacred, beneficent, mother of earth and wives of seas. " Later, there is a mention of the various regions of India and the names of races residing in them. In the beginning, regions at far away frontiers are described. 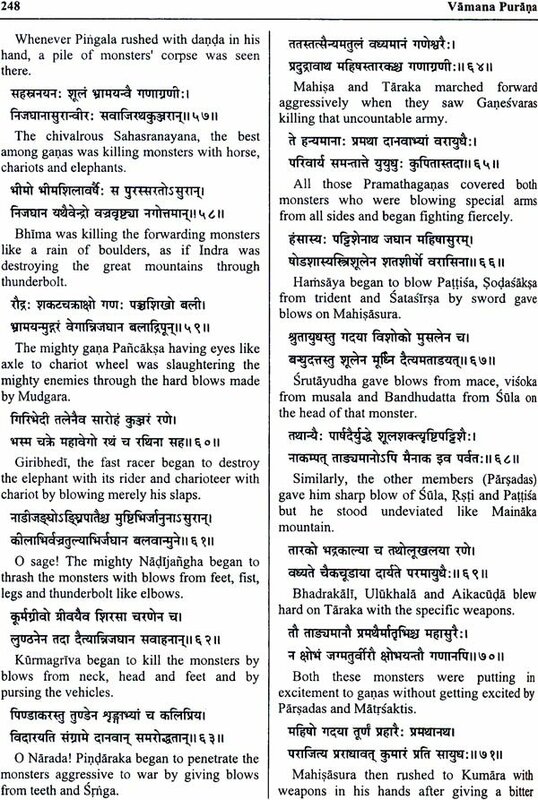 Kusndra, Kila kundala, Pancalaka, Kausika, Vrka, Saka, Barbar, Kaurava, Kalinga, Banga, Anga etc. are the kingdoms. In these kingdoms live various races as Marmaka, Abhira of middle countries, Sadhya Dhanaka, Brahmalika, Kaltopada, Apranya, Sudra, Pallava, Sakhetaka, Gandhara, Yavana, Sindhu, Saubir, Bhadraka, Satadrava, Lalithya, Paravata, Samnsaka, Kadhara, Kaikaiya, Dasana etc. these include people belonging to Ksatriya, Vaisya and Sudra castes. Apart from these, there are Kamboja, Darada, Bardar, Aanga Lokika, Vena, Tusara, Atriya, Bharadvaja, Prasthala, Daseraka, Lampaka, Cudika, Alasa, Alibhadra which are all reaces of Kirat people. Kirat races one those semi-civilised races which are found it central India and Assam. After this is given a long list of kingdoms and kingships and Democratic states which are located all over India. Out of these only a few can be identified from their present names. Still, their comparison with descriptions given in other' contemporary books sheds sufficient light on the geographical and political conditions in those ancient times. After describing the religions of all races and divisions, the supreme position has been accorded to Moral conduct to which nobody can have any objection. Stating its importance, it is emphasised, "If a person is not morally correct, all yajnas, charities, austerities etc. performed by him are of no avail. An immoral person cannot have prosperity or peace either in this world or the next world. Morality is a tree whose root is Dharma; whose branches are wealth, whose fruits are fulfilment of desires and whose fruits are salvation. In this context, the Rsis have prescribed the recitation of "Mangal Stotra" or "Beneficial Hymns" early morning which is very significant. That stotra refers to the sublime elements in our vast universe, Indian religions and nation. Every person can draw great inspiration from that stotra "Brahma, Visnu, Mahesa, other Devatas, Sun, Moon, Mars, Mercury, Jupiter, Venus, Saturn - these seven beneficient planets, Bhrgu, Vasistha, Kratu, Angtra, Pulastya, Pulaha, Gautama, Raidhya, Marlci, Cyavana and Rbhu - all these Rsis may make this morning of mine auspicious. Sanatkumara, Sanak Sanandana, Sanatana, Asuri, Pingala, seven original musical notes, seven flavours, seven musical instruments - all these may make this morning of mine blissful. This earth full of fragrance, this water full of flavours, this air full of sensation, this fire full of energy, this ether full of sound waves - all these five great elements may make my morning prosperous. The seven seas, seven mountains, seven Rsis, seven Islands and seven regions may make this morning of mine propitious." If this stotra is deeply meditated upon, then all matter and energies of this universe get fully invoked. If we recite it with devotion and comprehends its meaning, then certainly we shall feel one with the Supreme Soul of our universe. Then we shall see none as our opponent or enemy. Thus, there can be no better universal prayer. We can even say that this stotra is an extension and expansion of whatever we pray for in the Supreme Gayatri Mantra.